Know what it takes for Asian Managers to succeed in a MNC? Improve your current situation and get ahead faster? 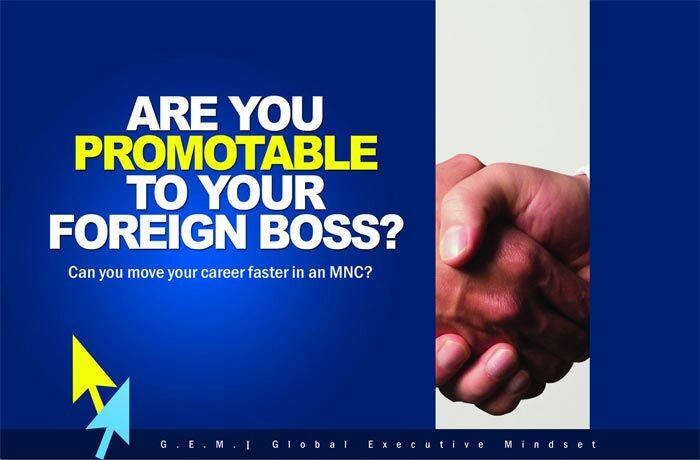 Find out what your foreign boss is looking for? Learn what strategies others successful Asian leaders use to thrive in their MNCs? Achieve results, build relationships and communicate clearly with business partners across multiple geographies? If you answer “Yes”, then you must attend The 7 Facets for Asians to Thrive in a MNC training – a unique and breakthrough program that is being run in Asia and the US.We will show you how a combination of respect for elders, over-emphasis on humility and technical competence, and other cultural aspects have contributed to the self-effacing Asian style. While this discipline and sense of quiet achievement have powered Asia’s economic growth, global MNC’s needs are different. Global MNCs are focused on building a cadre of Asian leaders who are confident, outgoing and able to make an impact across cultures and in the boardrooms of major U.S. or European corporations. Excel in a MNC by understanding and recognizing cultural inhibitions among Asians and how to overcome the limitations that they create when unchecked. Tap into your inner confidence and create a powerful and professional presence within a MNC environment. Build relationships and trust with all levels, including stakeholders, peers and associates across cultures to influence and connect instantly with those who can support your career path. Enhance communications skills to help you stand out from your peers and gain visibility within the organization. This unique program is designed by a dynamic Asian-born leadership expert and trainer who has risen through the highest ranks of global MNC’s. Stephen Krempl has worked with Fortune 500 companies for more than two decades. At Motorola he rose to become Regional Manager before working with PepsiCo and YUM Brands (where he last served as VP YUM University in Louisville, Kentucky USA) and Starbucks where he last held the position of Chief Learning Officer based in Seattle. An author of several books on learning Across Multiple Locations and leadership change, Singapore-born Stephen has coached hundreds of executives in the U.S., Europe and Asia on organizational and behavioral change. He walks the talk, and has a clear message for the thousands of Asian executives striving to make a difference to the corporation: “If I can do it, so can you.” says Krempl. “Stephen Krempl’s dynamic, upbeat tempo and facilitating message captured the attention of an audience of our senior leaders in a recent meeting in Houston… a powerful lively demonstration provided each individual with a memorable experience. His skill at working with and engaging the audience made his presentation fun and entertaining.” Ray Vigil , CLO Humana Inc.
GEM in Singapore was held at The Singapore American Club. It was our inaugural international training and it was a great success! It was attended by many multi national corporate senior executives, managers, members of the Singapore American Chamber of Commerce, The Singapore American Association and students from major U.S universities. Presentation at 2nd Asia Corporate University Summit 2011 in Jakarta, Indonesia at the Telkom Indonesia Corporate Facilities. GEM University/Colleges inaugural Webinar took place. GEM was trained worldwide. The webinar was ‘orchestrated’ from Moscow, Idaho USA as the University of Idaho GEM team had put this webinar together primarily for U of I students though it was open to ALL. Talk at PETRONAS corporate HQ, Twin Towers, Kuala Lumpur, Malaysia. GEM @ U of I happened on campus at the University of Idaho Moscow, Idaho, USA.